First game of a new season – Same Old Story – 3 POINTS! 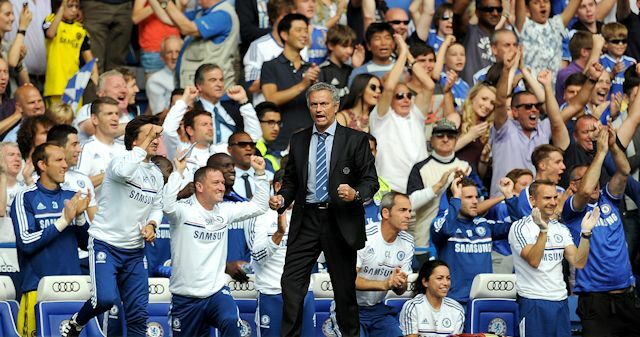 After almost 6 years out Jose was finally back in the Chelsea Dugout. More Mature, lot wiser and certainly a winner! Oh we missed him so very much. No words can arguably do justice to that, we the fans love him, adore him and he deserves every bit of it. The Bridge was a live wire today. Banners appreciating Jose and welcoming him back to his ‘Home’. The Special One got a welcome he well and truly deserved. All the pre-match spotlight was for Jose and when the game was underway it was Mourinho’s men in the ascendancy from the first minute. The trio of Hazard – KDB – Oscar was causing all sorts of problems. The dynamic trio interchanged which made marking them virtually impossible. Chelsea won an early penalty but uncharacteristically Frank Lampard failed to convert. Soon after Chelsea broke the deadlock when Hazard cut in and found De Bruyne who put the ball in path of Oscar, he obliged and calmly slotted in past the keeper. 1-0 Chelsea! Lampard soon made it 2-0 with a stunning freekick from distance. Chelsea were in cruise control and playing exquisite football. One of the best 45 minutes I had seen Chelsea play for a long time. Allan McGregor the Hull Goalkeeper had a great first half between the sticks as he denied us several clear cut opportunities. If not for his heroics Chelsea would have been 5 up at Half Time. In the 2nd Half Chelsea were not as big a threat they were in the first and Hull tried to get back into the game but our backline stood firm just like the Jose’s Chelsea. Schurrle and Lukaku were thrown in to add a new dimension later in the half. Lukaku and Schurrle almost combined for the third but it wasn’t to be and the game ended in a 2-0 win. Fernando started up front with the creative trio behind him. He linked up quite well and won the team a penalty early on (Lampard missed). Torres critic today was that he was dropping too deep when linking up and not getting into the box as much as we would have liked. To be very honest it was a decent performance largely down to his movement and linkup play but he never looked like scoring and the fact glares us in the eye that we need a top class inform striker to lead the line for us. The supply to him was cut down considerably in the second half which continued with Lukaku as they two became largely isolated from the midfield. Surely Jose would have seen it and will make it work in the coming games. The trio was fantastic in the first half as they interchanged and made it difficult for the Hull players to mark them and it was the three who combined to score the opener for Chelsea but as the game moved into the second half the creativity became very much limited. While Hazard had an average game IMO or maybe we expect a lot more but there is no doubt that he is capable of a better performance that the one today. Oscar was fantastic and oozing quality in the first half. KDB’s display was promising too, that ball to set up Oscar was brilliant. We can expect them to get better as it was just the opening game and with Mata and Schurrle thrown into the mix we can expect great things under Jose from the trio behind the striker. Schurrle did put in a good show for the 20 odd minutes he was on the pitch, looks a good prospect. While some of the fans have been skeptical about the money spent on him so far he has been decent and I don’t see a reason why we should be slating him. 5-6 games atleast in the Chelsea blue unless the judgment is passed. Chelsea backline remained solid for most part of the game and wasn’t really troubled by the Hull forward. A positive point was how Chelsea tackled the set pieces, for most part without any problem at all. Ashley Cole and Ivanovic were good too but Cole didn’t go on the overlap like we all know him but defensively was fine. Cech was never really tested, one of those days when he could take out his Samsung S4 and play Angry Birds the entire 90 minutes, he did make a save when called for the rescue. So it was a far less hectic day at the office for our legendary GK. All in all it was a pretty decent performance by the boys and we now look to the next game on Wednesday at SB vs Aston Villa, who thumped Arsenal at home. What can we do differently against Villa? Chelsea need to keep one eye on the game vs Manchester United at Old Trafford. Surely that’s one game that is going to set the tone for the season. Starting Lukaku vs Villa would be crucial since we would like to rotate our strikers a bit. Also it will be Lukaku vs Benteke a duel for the main man upfront for the Belgian National Team. Mata might be back in the Starting XI fully fit and will get much needed game time before the showdown in Manchester. Van Ginkel in place of Lampard maybe in order to keep Lampard fit. He is 35 and surely he can’t last another 90 minutes in midweek and still start the game against United. Surely Jose will keep that in mind. Cech; Azpilicueta, Luiz (If fit), Terry, Cole; MvG, Ramires, Hazard, KDB, Mata, Lukaku. Looking forward to it already! The games coming thick and fast, that’s what we waited for all summer! Why Jose is primed for more success in his 2nd spell! Whats your reason for starting KDB ahead of Oscar? Ermmm Rotation? my preferred lineup was game specific and not for the season. I see Oscar as a pivot player as the season progresses. I really do. Hazard may have had an off game but there is no one better on the left flank for us than him. He is crucial .. Rest we can chop and change we will take time to figure out what our best 11 might be .. rotate to know that and then carry on with it? Mou should at least put luiz on the bench even if he is unfit. The speculation surrounding his possible departure is very worrying, and even though many reports suggest Mou wants him, the same can be said about Roo. Luiz must be on the bench if he is unfit, if not people will continue linking him with Barca, and the press will only speed up any departure.